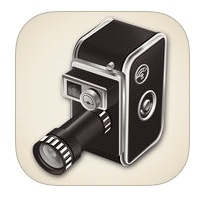 8mm vintage film app for the Apple IOS platform. This app for the iphone is just the business. Settings within the 8mm vintage film app allow the user to choses from different 8mm film looks. You can choses 1080P at 4:3 or 16:9 aspect ratio. Other options that the 8mm vintage film app are lens flare and a frame jumping mode. All clips can be saved to your camera roll or exported to your favourite social media sites.